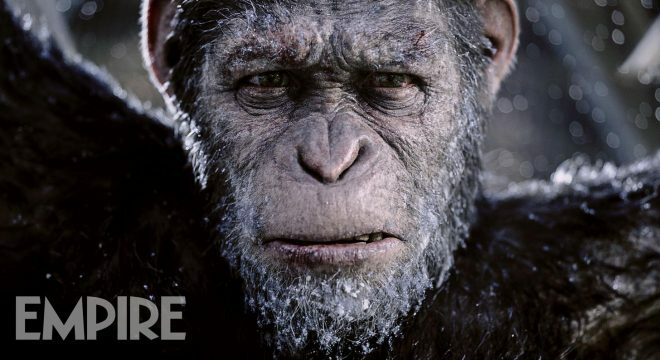 With little under a month to go until release, 20th Century Fox’s marketing machine is beginning to fire on all cylinders in anticipation of War For the Planet of the Apes, Matt Reeves’ blockbuster threequel that will tee up a “biblical” clash between The Colonel (Woody Harrelson) and Andy Serkis’ radically evolved chimp, Caesar. It’s not so much the final Apes film as it is the final chapter in Caesar’s story – for now, at least – and as you’ll see from Empire’s all-new close-up, Serkis’ glowering lead is looking a little worse for wear. Shot on 65mm film, Reeves and his creative team have undoubtedly swung for the fences with War For the Planet of the Apes, and from the trailers, TV spots, and scintillating promos alone, we’re quietly confident that the film will deliver in the visual department – and then some. Story-wise, we know War has carved out room for Amiah Miller’s Nova, a character that ought to resonate with longtime fans of the Apes series given she was originally portrayed by Linda Melson Harrison all the way back in 1968. Striking up a bond with a mute human girl certainly wasn’t part of the plan for Caesar and his simian tribe, but we understand Nova is set to be fairly instrumental in the movie’s grand narrative, one which Matt Reeves compares to that of a biblical epic. I wanted this film to be like a Biblical epic. Mark [Bomback, Reeves’ co-writer] and I looked at classic war movies: The Bridge On The River Kwai, Patton, Apocalypse Now. But we were also thinking in terms of things such as The Ten Commandments. I wanted it to feel very intimate in the foreground, but with grand vistas always dwarfing [the characters]. In a sense it’s about these two species pitted against each other and nature being greater than both of them. I wanted a David Lean ape movie. War For the Planet of the Apes gallops into theatres on July 14th. So far, and thanks to the back-to-back success of Rise ($448 million) and Dawn ($710 million), Fox’s Apes franchise has proven to be a lucrative, critically acclaimed juggernaut, but can War continue that blistering hot streak in a few weeks’ time? We’ll find out very soon indeed.